New Life Spectrum: Thera A or Regular??? 55g convicts with giant danios? Does any one know about algae eaters? Zebra danio with wierd caudal fin? Help! How can I transport my fish? ammonia rise in cycled tank? 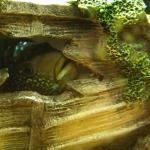 puffer in a community tank? ?